Making this salad is easy. 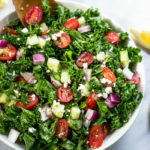 Chop up everything and toss it all together with your lemon olive oil dressing which is a combination of 2 part olive olive and 1 part fresh lemon juice. I like to marinate the kale in the dressing and let it soak for at least 30 minutes. This allows4 the kale to soften slightly and lessen some if its bitterness. To make the dressing:In a small to medium mixing bowl, combine olive oil, lemon juice, garlic, oregano, salt, and pepper. Whisk until combined. Combine all the chopped ingredients in a large bowl, pour dressing over salad and mix. Sprinkle with extra feta cheese before serving. Prepared and dressed salad can be stored in the fridge for up to 48 hours.